I’ve owned a stovetop pressure cooker before and found it to be an appliance that was okay to use. It didn’t live up to its promises (so fast!) but did prepare food slightly faster than the conventional stovetop method. I think my stovetop pressure cooker broke, or I wandered away from it and donated it. 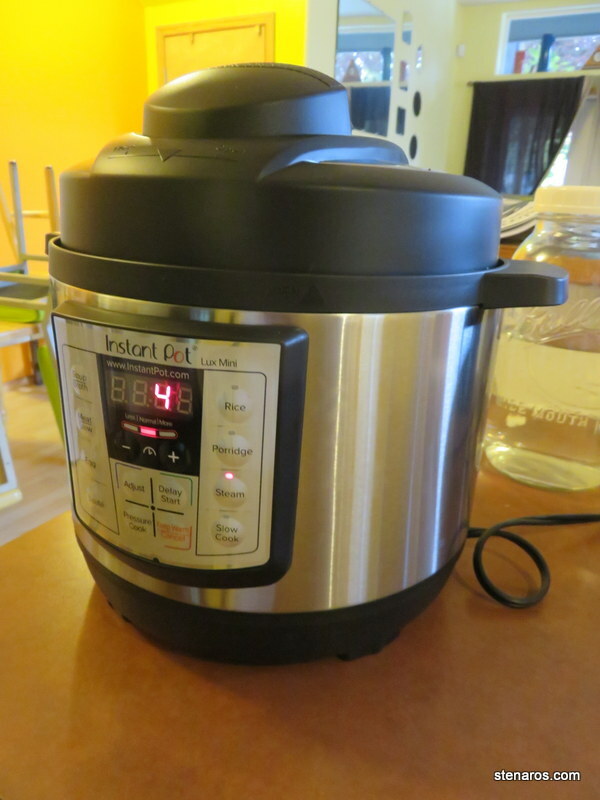 However, I was intrigued by the Instant Pot because it has both the pressure cooking attributes and a slow cooker function. I hadn’t replaced my slow cooker when it broke and I did, from time to time, wish I had another one. The price was prohibitive, and I’ve been biding my time, figuring eventually someone would have theirs up for sale for cheap because it didn’t quite fit into their cooking routine. However, this weekend Fred Meyer put their 6-quart jobber on sale for $79.99 plus a $10 FM gift card and I snapped it up. It actually rang up even cheaper than that ($59.99) which I reluctantly told the cashier. She shrugged, and let me have it for the lower price. I’ve had this for two weeks now and can report that I think this will be a permanent and well-used part of my cooking tools. Here’s the reason why: it’s a countertop appliance. Most of my cooking is done in one or two long sessions on the weekend. This means that sometimes space on the burners is at a premium. Being a countertop appliance, I can set something up, program the timer, walk away, and continue doing four other things until the Instant Pot cooking cycle is over. With a stovetop pressure cooker, not only did I lose a burner, but also I had to do a good amount of futzing with the burner setting to maintain pressure. I love also that I can sauté in the Instant Pot. With my slow cooker, I would have to sauté in a pan and transfer the food to the slow cooker. Otherwise everything came out with the same mushy long-cooked flavor that I didn’t enjoy. I haven’t yet used the slow cooker function, so I have no report on that, but Steam, Rice, Soup and the pressure cooking functions have worked very well for me. In fact, on Saturday I used the Instant Pot six times, making brown rice, white rice, black beans, red beans, chicken and lentil soup, and Indian butter chicken. 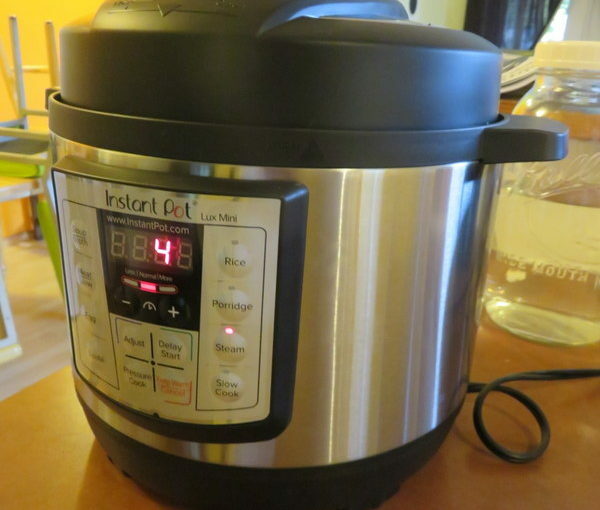 First-time users of pressure cookers might find the time savings to be negligible. You have to let the unit come to pressure, which takes time, and then it cooks at pressure, and then while you can quick release, for some things you have to let the pressure cooker come down naturally from full pressure, and by that time, you could have just done it on the regular stove. But I was aware I wouldn’t win much time. And unaware of how freeing the Instant Pot would be. I love that you are enjoying it so much! We have been debating getting one, partially because of that incredible searing function. I crock a lot and feel the same about having to transfer items to add that flavor and crunch to the slow cooker – which then kind of negates the set it and forget it one pot wonderfulness of the crock pot! Jess got one for Christmas this year and seemed somewhat meh about it at first. I got her a fancy cookbook and I think that might have helped! It got used for three things today (zucchini soup, cooking Lima beans, cooking chicken thighs) and will be used as a slow cooker tomorrow when I put together the sauce for the birthday dinner celebration. And then again on Sunday when I cook the polenta. I’ve not done polenta yet. Let’s hope it goes well.